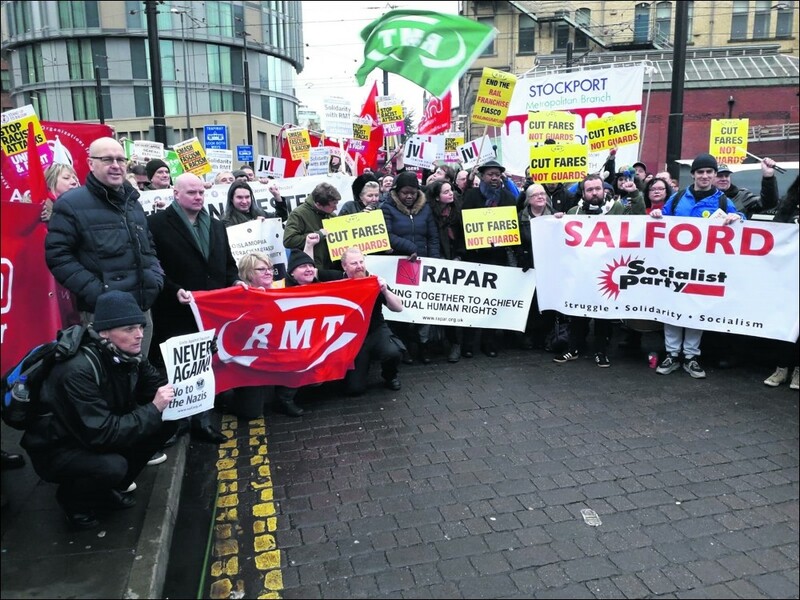 On their 44th day of strike action RMT members were joined outside Manchester Victoria Station on 12 January by hundreds of other trade unionists and supporters in solidarity with the strike to keep guards on trains. This followed the recent attack on pickets by a far-right group accusing the RMT of unlawful action and singling out a Sikh picketer for particularly disgusting abuse. Steve Notts, national executive committee member for Manchester and North West RMT, said: "We are overwhelmed by the trade union turnout in support. This is a dispute not over money, but the safety of the travelling public. "The strike has been rock solid and the union has actually gained members as a result of the dispute. We have also maintained the support of the public throughout the strike." The strikers are calling for keeping guards on trains while Arriva Rail North are still refusing talks with the union, intent on putting profits before safety. Tory transport secretary Chris Grayling has disgracefully failed to force the company to the table in a thinly veiled attempt to break the union. Michelle Rodgers, newly elected RMT president, called for this level of solidarity to be maintained in the coming weeks. She pointed out that the working class need to unite to get rid of the Tories. Socialist Party members have supported the strike for the past year and will continue to mobilise support for the picket lines. We sold 18 copies of the Socialist on the picket line in Hull. We call for the trade union movement as a whole to lead a fight against the far right but also for all unions to take action against the austerity, cuts and privatisation of public services which leads to the growth in support for these groups. Needless to say, despite their threats, the far right failed to show their faces on the day, showing what can be achieved when we fight back. Why not click here to join the Socialist Party, or click here to donate to the Socialist Party. Sorry to Bother You: "Socialist film Botox that made me feel young again"
Manchester Socialist Party: What could a socialist council do? Sudan - No to the rule of the generals! PCS: vote Yes for action, back socialists in the elections!